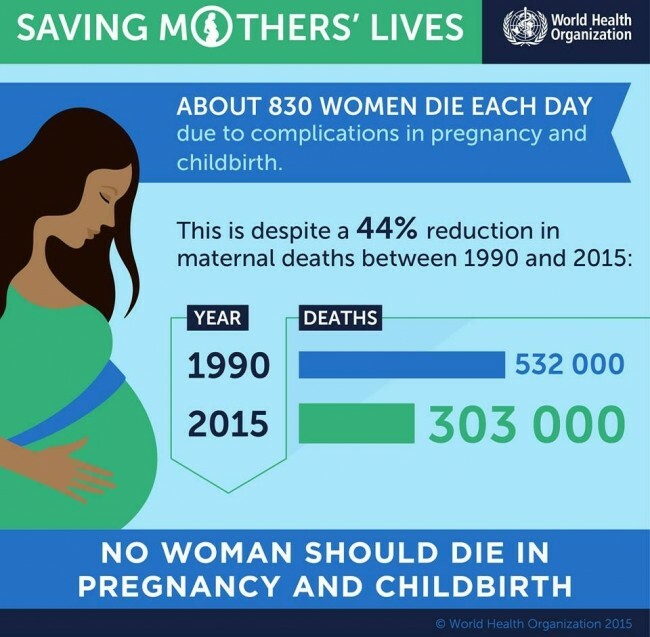 The World Health Organisation recently released a document titled "Trends in maternal mortality: 1990 to 2015". That document left my heart bleeding. 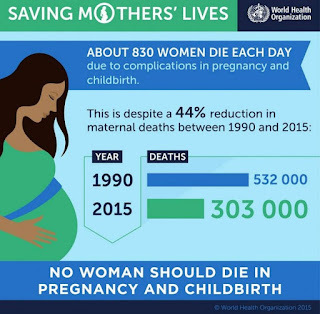 Despite recording a 44% reduction in global maternal mortality rates from 1990 to 2015, Sub-Saharan Africa accounted for 66% of the maternal deaths, with Nigeria accounting for 16%. The average annual change in maternal mortality rate in Nigeria since 1990 to date was placed at 2%. Forget the statistics and the figures, we are talking about human beings; women like me (and maybe you), our mothers, sisters, friends, colleagues and neighbours. We are taking about 867 maternal deaths per 100,000 live births in this age and time. If you are a Nigerian reading this, you'd know this figure could probably be less than the true figure as countless deaths go unreported. Hardly are the deaths in rural areas recorded. We need to really do something about this ridiculously high figure. We need to help save mothers from avoidable deaths. How? Get informed. Get enlightened. Throw away those behaviours, cultural and religious beliefs that put our lives at risk. Some of which are addressed as follows. Get medical attention once pregnancy is confirmed. You don't necessarily have to wait for the traditional 16 weeks post-conception to seek medical attention. Given the very high maternal mortality rate, we in our part of the globe should seek medical attention ASAP. This ensures that whatever that could go wrong is noticed early and if possible nipped in the bud. No matter how experienced you are, as per how many kids you've had, get early attention. Maternal death knows no experience. Eat healthy.We have countless myths surrounding what to eat and what not to eat in pregnancy. It seems the very foods which are necessary are forbidden in pregnancy. Foods like plantain, snails, meat, eggs, etc carry laughable myths that make the uninformed mum keep away from them. If in doubt, ask the TRAINED midwife or doctor nearest to you. Take your prenatal vitamins. With the nausea that often accompanies pregnancy this aspect is often difficult, but try in whatever possible way to achieve it as your well-being and that of your unborn baby depends considerably on it. Rush to hospital once you aren't sure what is happening to you. I was well known in the two places I registered for birth as I kept appearing off and on schedule for even the slightest disturbance. I had a myriad of questions to ask and when one doctor or midwife didn't have a convincing answer, I asked another. I knew almost everything that could go wrong at whatever stage and their signs. I believe one should rather be paranoid and safe than careless and dead. Pray. We are a religious people so I wouldn't forget to emphasise the need for prayers. At whatever stage, seek the grace of God to accompany you. But do not replace medical attention with prayers, each has its own role to play. Push myths aside. We have so many myths surrounding pregnancy with some bothering on the diabolical. Stick pins to your cloth, never cross your legs, never scratch your tummy, never spit on the wall, bla Bla bla. Some of which are from the pit of hell. Please put them aside. Don't even give heed to all the visions and dreams people tell you about. As much as possible, give birth at a registered health facility with at least a midwife in attendance . Heed your doctor's or midwife's advice. Many maternal deaths have occurred as a result of the mum's refusal of assisted birth. If your doctor suggests a cesarean section, if you aren't convinced, seek a second or maybe third opinion from a medical practitioner and not your pastor or man of God. The issues to address are countless. When in doubt, ask your midwife or doctor. Even though we have a medical system which leaves so much to be desired, the ridiculous death rate can be drastically reduced when we do what is up to us. We should do those up to us while those in charge of policies and laws guiding right and wrong in maternal care do theirs. May we lose neither our lives nor that of our loved ones in the process of bringing forth.